Can Opera Ever Become Popular? The browser market is stronger than ever. There are no less than five mainstream browsers and dozens of off-shoot projects such as Flock and Maxthon. Web developers have become passionate about their weapon of choice and spend many hours tweaking the software to perfection and evangelising the product to whoever will listen. Opera has been around longer than most. Originally started in 1994, the browser was publicly released in 1996. Version 3 arrived in 1997 and deserved high acclaim for being far more advanced than Internet Explorer and Netscape. Opera is lightweight and fast. The early versions would fit on a single floppy disk and, even today, the download is a little over 5MB. That is far less than other browsers, especially when you consider it includes an email client and perhaps the best integrated RSS reader. Unlike competing projects, Opera uses its own HTML rendering engine which has a reputation for being one of the fastest around. Opera was also a successful commercial product until 2003; it was IE’s main competitor given that the early versions of Mozilla and Netscape 6 were awful. Version 7 introduced advertising but, from version 8 in 2005, the product has been ad-free and free to use. However, despite all the plaudits and a cult-following, Opera usage has remained far lower than IE, Firefox, and even the newer Safari and Chrome browsers. The statistics vary, but Opera in unlikely to have more than 2% of the market. 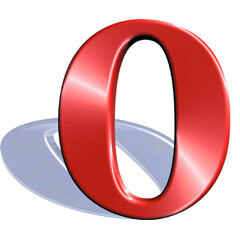 It may not have the marketing clout of Microsoft, Mozilla, Apple and Google, but Opera is well-known. So why do so few people use it? Opera has been installed by many users – especially developers – but it may not be their default browser. I use several versions for website testing, but still use Firefox for general browsing. The interface is too OS-agnostic. Opera is attractive, but it does not always look like a native application. There are too many options. User preferences can be tweaked extensively, but the range of options and some of the terminology can be confusing. Extensions and widgets have only recently started to appear. Opera is great, but offers few compelling reasons to switch from your favorite browser. Even these reasons do not explain why Opera has not become more successful. Do you use Opera? Why do you think adoption rates have remained lower than competing browsers?